Our kids get so excited for the first day of snow. We've had a few good storms so far and made a few snowmen but it has all melted. We are hoping to "Let it Snow, let it snow, let it snow" so we can build more snowmen. 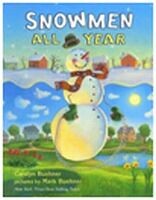 Snowmen All Year is written and illustrated by Caralyn and Mark Buehner, who reside in Salt Lake City, UT. The snowman gets to experience swimming and the 4th of July Fireworks (pictured at Sugar House Park) and trick-or-treating. Such a fun book for younger children. Here are a few of our other favorite Snowman Books (and the classic movie I remember watching in Grade School). Character Snowman: If your kids like a certain character, try to model your snowman after them. 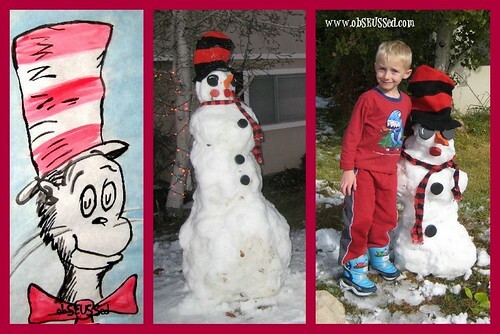 We love the Cat in the Hat so our snowman always wears a striped stove pipe hat and striped scarf. WATER COLOR PAINT: Have your kids look at a picture of their favorite character and try to replicate it with water colors. I painted the first picture with my children's water color set. It is a large 12 by 20 inch picture we have framed that hangs in our reading room. My daughter likes to help me make these. We've made them for grandmas and her school teachers. We get out all the supplies then she assembles them and I add the hook. 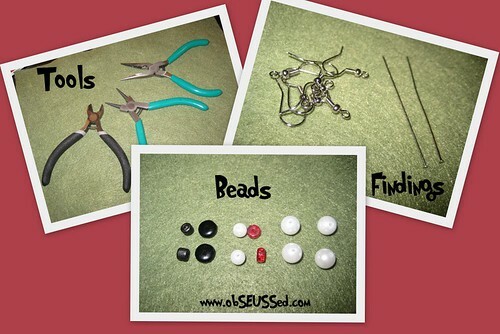 2- Fish Hook Ear Wires (I like Sterling Silver) can be found most places beads are sold, like at Joann's. 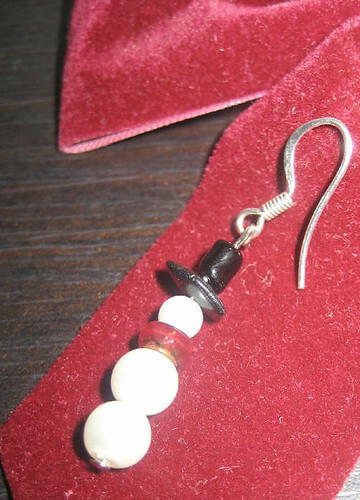 3- Faux pearl beads, white. 2 larger (8 mm) 1 smaller (6 mm). They often sell assorted size sets. 2- Red Rondelle Spacer beads for the scarf, these would be pretty from Sunset Crystals. 2- Black Saucer (or Rondelle) beads (8mm) for the hat rim (here are some on Etsy) I used a rock chip. 2- Black Short Tube Beads for the top hat -sample at Artbeads (or a cube) something like this at Joann's. 1. Take the headpin and put the two larger pearl beads on, then the red rondelle (scarf), then the smaller pearl bead (head). Now put the black saucer bead on (hat rim) and the black tube bead (top hat). 2. 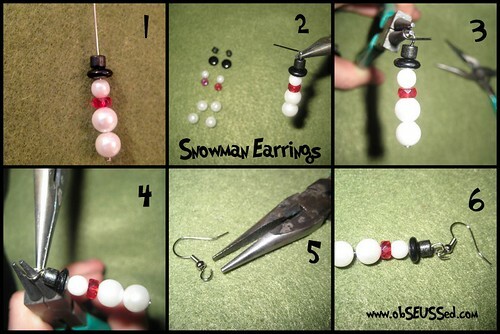 You only want about 1/2 inch of the headpin above the snowman so if there is more, use the wire cutters to trim it. Use the pliers to Bend the top of the headpin in a 90 degree angle. 4. This is the tricky part. 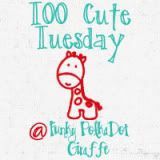 Use the round pliers to pinch the head pin and use the needle nose pliers to wrap the tail of the headpin around the headpin towards the beads until it is all wrapped with no overhang. 5. Use the needle nose pliers to open the circle on the bottom of the fish hook earring finding. 6. Connect the headpin loop and the fish hook circle. Then use the pliers to close the fish hook loop. Here is a great video for a simple way to connect the dangle beaded headpin to the fish hook earring. 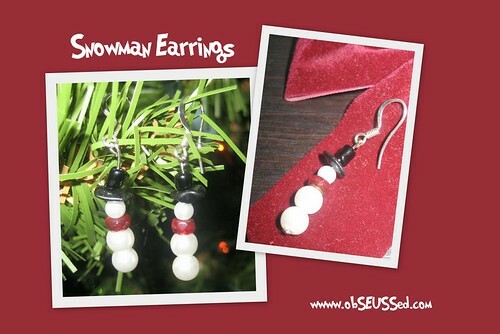 You can wear your snowman earrings all winter long, not just before Christmas. These make great teacher gifts. Utah readers: Don't forget to enter my giveaway for a Thanksgiving Point family, annual membership ending this Fri.
Today's Creative Blog, Get Your Craft on Tues. 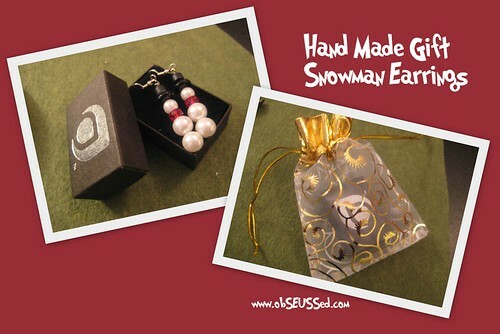 The snowman earrings are darling!!! Love them! And I didn't know there was Snowman All Year!